Hamburg 2016: Energy transition is "no walk in the park"
GERMANY: Europe is no longer the number one in renewable energies said WindEurope CEO Giles Dickson in Hamburg, reflecting a soberly thoughtful atmosphere that pervaded the exhibition and conference. German delegates certainly had plenty to be thoughtful about. The Energiewende — the transition from fossil fuels and nuclear to renewables — has so far involved picking the low-hanging fruit, but it is now causing disruptions, said Andre Poschmann, Germany’s economy ministry expert on EU electricity issues and market integration. "Designing the new system in Europe is not a walk in the park, it is very difficult," he said. "In Germany, we see it is not easy to reshape the whole system." Many in Europe are waiting and watching while others do the testing to see how it can work. Some see the need for a complete back-up generation park for the renewables system. Others see the "internet of things" and think the market should be left alone to figure out this new world. And there are some who prefer to protect the past rather than look to the future. "The cost debate on renewables is over now. But how it should all work together for a secure energy supply? This is not proven yet," said Poschmann. His boss, federal economy minister Sigmar Gabriel, was more outspoken. "Austria is providing old oil power stations to ensure our grid security. They can’t get to sleep for laughing as this is an instrument for the Energiewende, a redispatch measure." At the root of this is a grid crisis. German transmission system operator Tennet has heralded an 80% increase in grid charges for 2017 entirely due to higher costs for network stabilisation. And roughly half the costs are committed to compensation for wind curtailment due to transmission bottlenecks, mainly in northern Germany. In 2015, wind curtailment by Tennet cost €350 million, conventional power station redispatch measures amounted to €200 million and the network reserve, kicking in after redispatch measures, a further €150 million. Two important transmission projects from north to south Germany are about three years behind schedule, according to Tennet. The 80% increase on expected higher, but not yet specified, network stabilisation costs in 2016, "has triggered a huge discussion", said Hans-Dieter Kettwig, managing director of German turbine maker Enercon. Decentralised storage should help but with increasing volumes of wind power coming on the system, the wind industry has to tackle this issue, he said. Not an easy task. Peter Schell, vice-president of regulatory affairs at Belgian demand response specialists Restore, echoed Poschmann’s view at the conference. 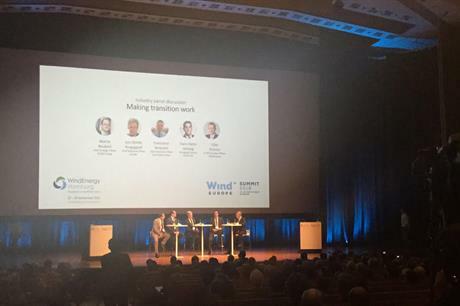 "Making the energy transition work is work", he said at the 'What wind can bring to the balancing markets' session at the WindEurope Summit, taking place in alongside the WindEnergy Hamburg exhibition. The debate swung wildly from whether all wind farms should be equipped to provide electricity network balancing capability, even though the overall amount required across Europe is small, to whether it makes more technical and market sense for photovoltaic generation and batteries to do the job. Reshaping electricity wholesale markets is another complicated ballgame. For highest efficiency in taking wind generation to the wholesale market, the energy trading gate closure time (when bidding ceases) needs to be as close as possible to delivery time. Wind forecasting is then at its best. "We are working towards a five-minute market by 2025," said Susanne Nies, corporate affairs manager at ENTSO-E (European Network of Electricity Transmission System Operators). But some EU member countries are not yet down to one hour. "It’s extremely tough to keep everyone on one page," she said. As wind and solar input grows, the regional distribution network operators, connecting up most of the capacity, also face challenges. Under pressure to deal with grid congestion, they need to become smart quickly, or risk being replaced with microgrids, warned Schell. The massive upscaling required in sophistication of distribution level operation is highlighted by distribution grid operator UK Power Networks, owned by the Cheung Kong Group. It informed customers in September of power cuts lasting up to eight hours in areas of southeast England to take place in October, while trees are being trimmed around overhead lines. German engineering organisation federation VDMA is also working hard to encourage more cooperation among sub-suppliers to the wind industry. When auction mechanisms are squeezing returns, it seems "absurd", said one source, that around 30 gearbox types have reportedly been under development just for 3MW turbines in the past 18 months. Or that rotor blades are identical apart from the number of fixing bolts, requiring separate production batches, instead of harmonising design in this detail and reaping economies of bigger production runs. Siemens’ Winergy and GE Power Conversion supplying, respectively, gearboxes and inverters across the wind industry, indicates that their customers accept mutual suppliers. "The European Commission is one your strongest allies. There is now way back," was the rallying message from Maros Sefcovic, the EC vice-president in charge of the Energy Union, to conference delegates at Hamburg. The words were welcome as Germany’s industry grits its teeth to face the proposal for a revised renewables directive at the end of the year. But the workload is unlikely to get lighter.